The rate at which change is happening in Rwanda is astounding. The airport for example now has a couple of small deli-type places to get a bite to eat and Bourbon Coffee Shop. 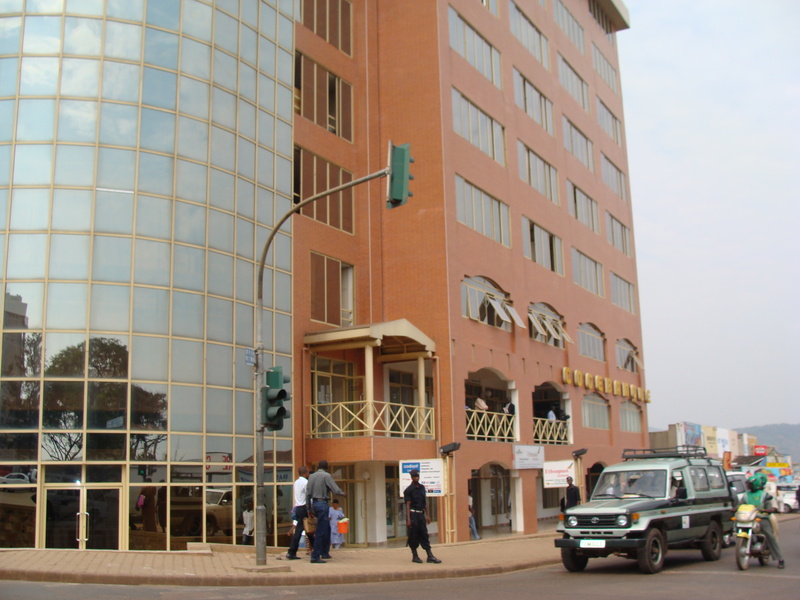 It’s Rwanda’s answer to Starbucks with 2 other locations in downtown Kigali. Rwanda is known for its Arabia beans, with the right elevation, climate and volcanic soil, the western part of the country is ideal for growing coffee.In the past 10 years Techno Serve and the Gates Foundation have come together and are working to help smallholder coffee farmers organize and develop co-ops and build washing stations. As a consolidated group rather than individuals they can do business with big coffee buyers such as Starbucks, marketing it as a specialty boutique coffee. This insures less middlemen, more profit in the farmers pocket. If you’re interested in sampling this delicious coffee here’s a link – http://shop.coffeerwanda.com/. A new VIP lounge has also opened in the airport, the Pearl Lounge, free for those traveling business or first class, complete with cocktails and WiFi.For those of us in steerage class, for a mere15,000 Rwandan Francs, about $25 USD, we too can be VIPs. The traffic, while not as bad as I-95, at rush hour can snarl and slow traffic to a creep. . On the way to the airport I was afraid I’d be late because we had to crawl halfway there. They have new traffic lights which neither Katie or myself can figure out how they work.You end up going when the lights are red as well as green and for some unknown reason and it kinda works. The streets are overrun with tons of motos (motorcycle taxis) which are the cheapest and most dangerous way to get around town.They sometimes travel in packs, swarming the road weaving in and out of traffic, horns blaring, coming perilously close to cars and trucks and killing the customer sitting behind them….only centimeters to spare. As always, the radius and density of electric lights grows along with new neat and tidy houses replacing the mud huts on the many hillsides that comprise Kigali. There arenew high rises jutting into the ever growing skyline that were in their infancy last time I was here in February – and we parked in a multi story parking garage…a new experience for me in Rwanda. 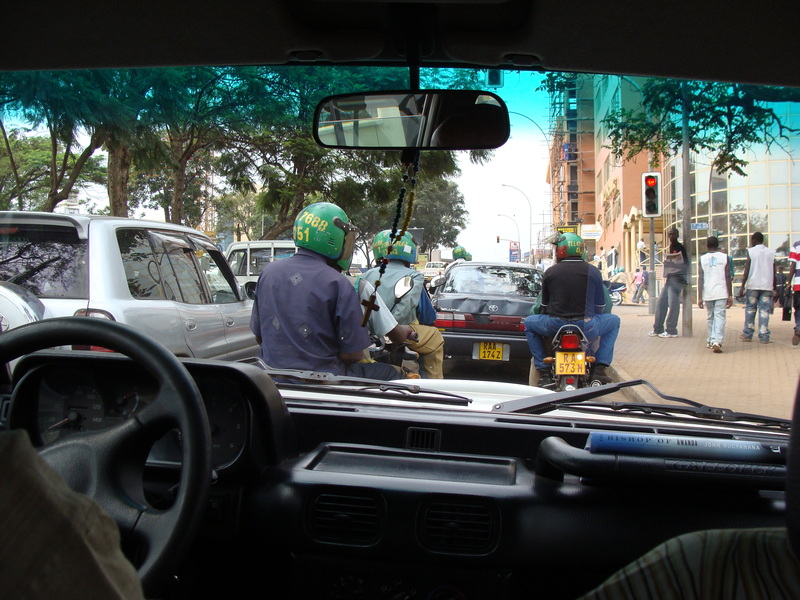 It has been a blur of days since I arrived in Kigali a couple of Saturdays ago…and now I’m homeward bound. We spent a lot of time out at the site. Pictures don’t do the building justice and in 2 dimensional drawings it’s hard to grasp the scale. The site is a beehive of activity; digging for and building the septic tanks as well as underground water cisterns, welding to secure the last of the trusses and excavation of the outdoor amphitheater. By the time I left our last site visit today, more than half of the brick red roof has popped up, visible from behind the 12 ft metal construction fence. Katie and I hiked up a hill behind the site to take a picture. From that vantage the Library/Learning center looks to be one of the larger buildings, along with some on the Rwinkwavu Hospital campus, in all the area. I’m sure at the next site visit Friday the roof will be up. 7800 square feet of hope and potential! What a difference a year makes! As I reflect on where we were last year at this time it’s amazing to think our goal is so near. Construction has moved along well and I’ll be heading to Rwanda October 21st to check things out first hand. With the roof scheduled to be up the later part of October, in time for the start of the rainy season, the 7,800 square foot Rwinkwavu Community Library and Learning Center will open its doors in the first quarter of 2012. Our focus this trip is on finalizing the myriad details that need to be in place to get us up and running. We’ve carefully thought out furniture, equipment, programming and staffing and how this will all work together. After a couple of years looking at two dimensional drawings it’ll be so thrilling to walk into the main entrance and through the RCLLC room by room. Imagine story hour in the preschool room, shouts of children on the playground, afterschool homework groups, soccer nights in the amphitheater, game night in the Reading Room, a group of adults practicing their English. A welcoming space characterized by the buzz of congenial congestion that’ll serve the needs of all age groups, bringing the generations and community together. We believe that ultimately, the quality of what happens inside the building, along with local participation and a feeling of ownership, will be what defines the success of the Center. Be sure to continue to check our blog for updates and photos from the road! 2010 closes with the great news that we will be breaking ground on February 7th!! Though it’s taken longer than we anticipated due to the uncertain economic environment, we have used that time well in preparing for what will take place in the building once we open the doors. We see the seeds of the vision we planted two and half years ago spreading its roots through our network of new and existing partners. The Rwinkwavu community continues to rally around the Rwinkwavu Community Library/Learning Center (RCLLC) and the promise it holds. Last March, Katie Uher, RfR Program Director, and our Rwandan university student interns conducted a series of 19 focus groups in Rwinkwavu to help determine the programming and scheduling needs of the community. It was a great opportunity, through these students, to connect with the leaders of the villages (umudugudus) in the sector to encourage local buy-in, build trust and make it clear that the success of the project relieves heavily upon Rwandan participation. The RCLLC is the only facility in the area suitable for housing the programming we plan to make available. True to our belief that collaboration not duplication is more efficient and effective, we continue to lay the groundwork for building solid partnerships and programming. Katie has researched African sources for books, learning materials and programming. In December, while taking a month-long Cambridge University certified ESL literacy training course in Cape Town, South Africa, she visited many of these sources: publishers, programming, audio books, educational toys and learning aids and more. Additional sources have been identified in Rwanda, Uganda, Kenya and Tanzania. Purchasing in Africa presents literacy in an African context, supports the African publishing industry and cuts down on the cost of shipping. In October Katie met with the top Clinton Foundation people in Rwanda. They are collaborating with Soyco in building an oil processing plant and cultivating soy fields near the Library/Learning Center, which will bring 1600 new jobs to the District. Soyco and Clinton Foundation plan to provide job skills and financial management training and are very interested in using the Library/Learning Center for this training and collaborating on programming. While the Library/Learning Center is under construction Katie will implement a pilot literacy program in Rwinkwavu in March. We will be able to assess, fine-tune and tailor the programming to best suit the needs of community, so we are ready to roll out the programming when the RCLLC opens its doors. To that end we recently met with LitWorld (www.litworld.org) head-quartered in New York, who has developed and executed excellent community-based literacy and literacy leader training programs in New York, Kenya, Liberia, Ghana and Iraq. They educate community members to become literacy leaders/trainers through easy-to-use programs and materials. We have identified several areas to start off our work together: preschool planning and curriculum, Girls Club/mentoring and on March 9th we will be participating in LitWorlds second “World Read Aloud Day”. Katie will be organizing Rwinkwavu community-wide participation. Allen Moore and I are heading over to Rwanda January 28th in preparation for our February 7th groundbreaking celebration. We have a lovely program organized and representatives from the Ministry of Sports and Culture, Ministry of Education, Ministry of Health will be attending as well as the Mayor and other local officials and the community. We’ll be sure to post pictures of the groundbreaking on our website blog as well as updated photos as the building goes up. Thanks to all who have supported our efforts! Stay tuned…….. The past year has seen tremendous progress in Ready for Reading’s mission and more specifically our development of a prototype for a community library and learning center to be constructed in Rwinkwavu in the Kayonza District of the Eastern Province. There are several key components that have contributed to our success. 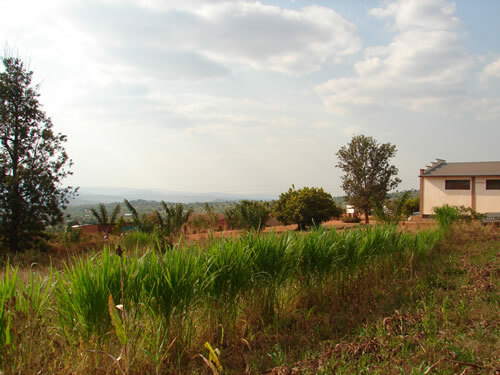 Rwinkwavu serves a large catchment area and is the site of the first Partners In Health District Hospital in the country. The location of the project along with partnerships have been essential in creating a synergy that has enabled RfR to get to the point where we are now poised to begin the construction of the Rwinkwavu Community Library and Learning Center (RCLLC). At the end of last summer (2008) I had the good fortune to make a connection with Allen Moore, a Boston area architect with 40 years of experience designing and overseeing the development and building of museum, library and educational spaces. Our meeting came about quite serendipitously as the result of a friend’s July visit to the National Yiddish Book Center in Amherst, MA which Allen was the lead architect on. She thought the village-like concept of the center might be applicable to the library we were planning to build in Rwinkwavu. Allen agreed to meet and see what the project entailed. At the end of our 45 minute presentation he graciously offered his services pro bono, telling us that 2 hours before our inquiry call he had decided to “retire” and only accept projects that were useful. Allen has now become one of the cornerstones in the Rwinkwavu Community Library and Learning Center project. In the last ten months, through countless hours of conversations, correspondence and a trip to Rwanda, Allen has taken this idea of a library and not only translated it into bricks and mortar but more importantly challenged the concept of what role a 21st century library in Africa should play. We believe the RCLLC should be the dynamic heart of the community reflecting and supporting the educational, informational and cultural/social needs of the population it serves. The RCLLC will provide a venue for a whole variety of programming with language and IT literacy training, after school tutoring, story hours, career planning, healthcare, gender issues, entrepreneurship and agriculture. We continue to seek organizations that specialize in specific areas to work with the librarians/staff in developing programming. The RCLLC will also serve as a cultural gathering spot with an adjoining amphitheater with a stage /podium for community performing arts, meetings and celebrations. The amphitheater will also provide a space for viewing projected audio-visual programs for those who are not literate, the first stepping-stone towards literacy. These offerings and opportunities will greatly expand the breadth of ideas and possibilities for the folks in Rwinkwavu and the surrounding area. By March 2009, we had put together well thought out schematic designs and programs for the RCLLC. Allen and I then traveled to Rwanda and presented our prospectus to the appropriate national and local officials, PIH in Rwinkwavu and other organizations/potential partners. The Minister of Sports and Culture, the Minister of Education and the National Curriculum Director on the federal level and the Mayor of Kayonza District, Executive Secretary of Rwinkwavu Sector, the Director of Rwinkwavu Hospital and local community leaders were all very supportive of the proposed project and were anxious for us to get started. As for construction, Allen has begun to collaborate with a Rwandan architect who will manage the project. Presently construction documents and specifications are being developed in order to obtain the required environmental and building permits so that building can be started as soon as the funding goals are achieved. 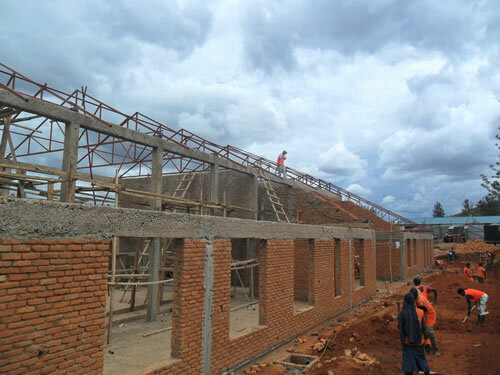 In November, Allen and I will return to Rwanda to review updated construction costs and qualified contractors. We will not begin construction until we have raised the whole amount required to build the RCLLC. We anticipate about 9 – 12 months will be required to complete construction of the building. Concerning programming, we have identified, through our conversations with government, that the pillars of the RCLLC at present must be language and IT literacy. These are our first priorities and we will also be researching ways to implement language and computer learning while providing information on issues relevant and important to the community. Providing information pertinent to people’s lives is a strong motivator in acquiring these skills that will help create socio-economic opportunity. We will be researching curriculum and looking to partner with other organizations who excel in this area. Katie Uher, RfR Program Director, has recently traveled 30 hours by bus with our Ugandan Community Library colleagues to go to the Pan-African Literacy Conference in Dar es Salaam, Tanzania. It’s the largest gathering of educators, librarians, literacy experts, publishers and writers in Africa with attendees from around the world. Katie traveled to the conference with our Ugandan colleagues from UgCLA (Uganda Community Library Association). UgCLA holds two workshops each year for community librarians from Uganda and now East Africa to come together and share and learn from one another. This growing group of libraries is affiliated with Friends of African Village Libraries ( www.favl.org ) working to form a professional network joining individual libraries and Library Associations in East Africa. RfR is working with FAVL Executive Director, Kate Parry to develop and coordinate its work on the ground. She is also researching book sources ( attending Book Week in Kampala, Uganda mid-September) and other organizations in developing strategies to encourage literacy and foster a culture of reading. We are working with a potential partner, Orphans of Rwanda, an organization that sponsors Rwandan university students, to put together an Internship program for the students to teach literacy and computer skills at RCLLC. Katie has been extremely successful in getting all these disparate pieces together and meets regularly with government officials to keep them apprised of our progress and involved in the project as it proceeds towards construction. Our strength is this network of talented and experienced partners/people we have been fortunate to gather together. They consist of a wide range of professionals who have shared their unique expertise enabling RfR to structure a strong foundation to ensure the long-term sustainability of the RCLLC. We are very grateful to everyone who has had a hand in shaping this project and continues to do so. It is truly a team effort. It has been your belief in what we are doing that has propelled us forward and we are working hard to take the RCLLC, the first public Community Library in Rwanda, from concept to completion.